Following their dinner at the Veranda(h) grill James Bond and Tiffany Case head out for a little entertainment. The smoking-room was almost empty and they chose a small table away from the platform where the Chief Steward was laying out the auctioneer’s paraphernalia, the box for the numbered slips, the hammer, the carafe of water. before arriving in the main first class smoking room. A look at the deck plan below shows that once again, Fleming got the details right. At the far right you can see the lifts, then they would’ve moved to the left in the diagram, going through the main lounge, then the ballroom, and finally into the smoke room, where the auction was being set up. The auction pool scene, where they sell off numbers based on the Captain’s estimate of how far the ship will travel in the next 24 hours is really a fascinating bit of storytelling. You have to wonder if Fleming was inspired by his friend Roald Dahl, who, in the January 19th, 1952 edition of The New Yorker, had published the short story Dip In The Pool. That story also involves an auction pool aboard a cruiseliner and a passenger betting on the “low” field and hoping to maneuver events to win the prize. The New Yorker was apparently a regular read for Fleming. He also got information on The Inspectoscope from the magazine. The story also became an Alfred Hitchcock Presents episode, and if you watch it, the room in which that auction is held looks very much like this shot here of the Queen Elizabeth main smoking room. Note the square pattern on the wall to the right and you’ll see the same thing in the AHP episode. 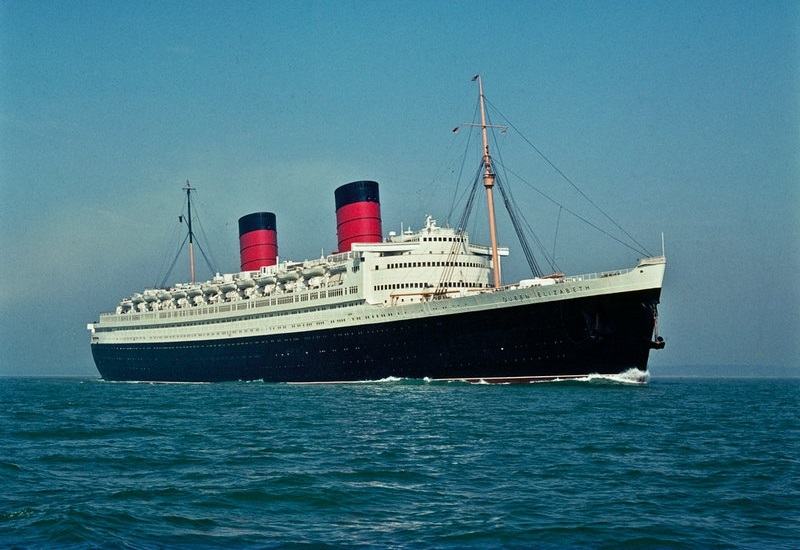 The story could’ve been set on the RMS Queen Elizabeth. Once again, I want to give credit for the awesome interior photos of the Queen Elizabeth to the rmsqueenelizabeth.com website. Worth a visit! Earlier in the day, James Bond and Tiffany Case had drinks in the Observation Lounge. That night they have dinner at the Veranda Grill. It was eleven o’clock and there was only a scattering of people left in the corners of the Veranda Grill. For once, we are not given details about the meal that they enjoyed that evening. We’ll have to take a look at a menu to see what they might’ve been eating that night. The Veranda(h) Grill was for First Class passengers. It was a step up from the cabin class, and certainly the tourist class dining options. After dinner, they head over to the Smoking Room and listen to the Auction pool. Three days into the voyage, James Bond and Tiffany Case make plans to have a drink in the Observation Lounge. They were thirsty for each other’s company after the three days’ separation, but Tiffany’s defences were up when she joined him at the obscure corner table he had chosen in the gleaming semi-circular cocktail bar in the bows. Observation Lounge aboard the RMS Queen Elizabeth. I think I can see the corner table. The Observation lounge was on the Promenade deck, at the very tip of the ship, and after Bond made a remark that upset Tiffany, she left the bar, and was “half way down the Promenade Deck” before Bond could catch up with her. The deck was the white space along the outside edges of the boat. Tiffany was out of there pretty fast! Check out the SSMaritime.com site for more outstanding pics.